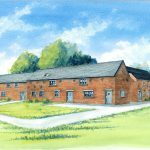 The Duchy of Lancaster has entered into a joint venture agreement with Chamberlain Developments to restore a Grade II Listed farmhouse and develop a small number of disused farm buildings in the heart of leafy Cheshire. Barthomley is a picturesque rural hamlet situated on the edge of the Duchy’s 1,380-hectare Crewe estate. 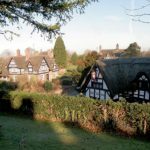 It includes a number of seventeenth century black and white half-timbered cottages and buildings of local importance including Town House Farm, a brick-built Grade II listed property which was built in the early 18th century. This large 7-bedroom farmhouse which has been owned by the Duchy since it acquired the Crewe estate in the 1930s is set in open countryside and includes a number of historic brick built barns and outbuildings. 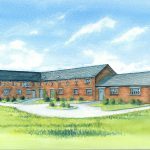 The proposals put forward by Chamberlain Developments are for an exclusive development of eight prestige properties – seven luxury barn conversions and a full restoration of the original farmhouse. Work started on site in February 2018 and the scheme is expected to be completed by Summer 2019. Chamberlain Developments is a family-run business with over 20 years’ experience of building individually designed and award-winning homes for local buyers in Cheshire, Staffordshire and Shropshire. The properties at Town House Farm are expected to attract high levels of interest once released for sale, given the site’s unique combination of open countryside, access to local amenities and strong transport and communications links.